PICCOs are also highly cell permeable and stable to proteases. favoring the isolation of highly selective ligands (Fig. 3). Clark, M.A. 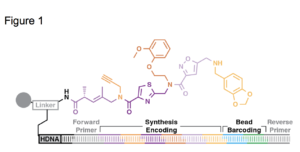 Selecting chemicals: the emerging utility of DNA-encoded libraries. Current opinion in chemical biology 14, 396-403 (2010). Clark, M.A. et al. Design, synthesis and selection of DNA-encoded small-molecule libraries. Nature Chem Biol 5, 647-654 (2009). MacConnell, A.B., McEnaney, P.J., Cavett, V.J. & Paegel, B.M. DNA-Encoded Solid-Phase Synthesis: Encoding Language Design and Complex Oligomer Library Synthesis. ACS Comb Sci 17, 518-534 (2015). Kodadek, T. & McEnaney, P.J. Towards vast libraries of scaffold-diverse, conformationally constrained oligomers. Chemical communications (Cambridge, England) 52, 6038-6059 (2016). 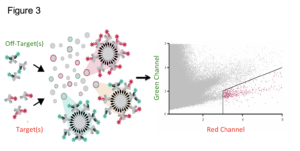 Doran, T.M., Gao, Y., Simanski, S., McEnaney, P. & Kodadek, T. High affinity binding of conformationally constrained synthetic oligomers to an antigen-specific antibody: Discovery of a diagnostically useful synthetic ligand for murine Type 1 Diabetes autoantibodies. Bioorg. Med. Chem. Lett. 25, 4910-4917 (2015). Gao, Y. & Kodadek, T. Synthesis and screening of stereochemically diverse combinatorial libraries of peptide tertiary amides. Chem. & Biol. 20, 360-369 (2013).